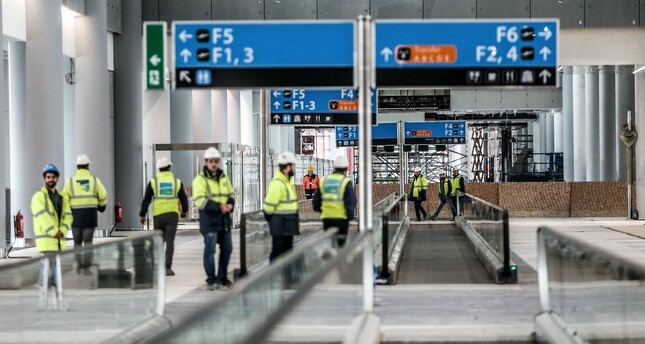 Construction workers inspect one of the terminals at the Istanbul New Airport, which officials say is 80 percent complete. With construction nearly 80 percent complete, Istanbul New Airport is on schedule for a grand opening on Oct. 29, the 95th anniversary of the Turkish Republic. Once fully operational, the new airport, set to become the world's largest, will strengthen Istanbul's position as a transfer hub and boost the Turkish economy with a nearly 4.9 percent contribution to the country's gross domestic product by 2025. The new airport, also known as the Third Airport, will transform the whole European airspace, operating direct flights to most of the countries in the continent. Accordingly, Turkey's General Directorate of State Airports Authority (DHMİ) has decided to expand Istanbul's airspace capacity. In a meeting with members of the press, DHMİ General Manager and Chair Funda Ocak confirmed that Istanbul New Airport will open on Oct. 29 as previously announced by the Transportation, Maritime Affairs, and Communication Minister Ahmet Arslan. "The third airport will be operational on the due date. All development works to this point suggest that there will be no delay or setback." She said that the crisis in the aviation sector was largely over in 2017 and the number of passengers has started to rise again. "With the arrival of Russian tourists in Turkey, the sector experienced a quick recovery and we have struck new cooperation deals with tour operators to attract more European passengers," the DHMİ general manager said. She said that the world was closely watching the project and that it will be Turkey's success story. She also confirmed that the first phase construction at the airport was 80 percent complete. Ocak said that state-of-the-art communication devices at the airport were ready for flights while assembly and calibration works will be carried out after the space allocation. She said that a number of airspace arrangements will be done before the new airport opens. "Istanbul New Airport will not only affect Istanbul's airspace, it will also have an impact on the European airspace. It will mostly affect the airspaces of countries that have direct flights to and from Turkey. Therefore, we have decided to expand Istanbul's airspace capacity," she said. Ocak added that some 100 air traffic controllers for the Istanbul New Airport have completed their training, while training of another 25 continues. "Twenty-five experienced controllers working in other squares will also join the team." Ocak also said that have supplied the systems and devices, prepared the procedure designs, issued the letters of agreement with the countries interacting in the whole European airspace, held relevant meetings, prepared "Eurocontrol" reports, and segregated their staff. "These have never been mentioned in the public. This is a very important issue. DHMİ did not just deal with the Istanbul New Airport projects, follow-up, supervision and control," Ocak continued. "It also made a great effort in terms of airspace in particular. These studies are still in progress. Hopefully, flight checks will be made after all systems and devices have been installed by July." She added that the 42-month period was not enough for the construction of a new airport that consists of two independent runways, 8 million square meters of covered area, 1.4 million square meters of the terminal and other support buildings, but the suitable weather conditions this year have helped them finish the project on time. About transferring Ataturk Airport's traffic and operations to the new airport, Ocak said the ceremony will be held on Oct. 29, while the transfer process will begin at 3 a.m. on Oct. 30 and finish at 23:55 p.m. the next day. "We have received a new flight code for Atatürk Airport from the International Air Transport Association (IATA). From now on it will work under the code ISL, and its current code IST will be assigned to Istanbul New Airport," she said. Cengiz Kurt, head of DHMİ Public-Private Cooperation Department, said that they divided the transfer process into three stages, adding that the biggest share belongs to Turkish Airlines (THY), followed by other Turkish and foreign companies. Kurt said THY will cut off flights at 02:00 a.m. on Oct. 31 and complete the moving process in 12 hours without operations. He stressed that it will be one of the world's largest transfer operations because given the size of the airport. He said the transfer will also be executed by road, noting that it will also have to deal with heavy Istanbul traffic. "We will need some serious coordination, but we don't think there will be any problems," he said, adding that the transfer will be done via the Basin Express Road and Mahmutbey Tolls. Kurt also noted that the municipality, gendarmerie and all the public institutions and organizations working on the route will be coordinated by the Disaster Coordination Center (AKOM), and traffic will also be cut off during the transfer if necessary.